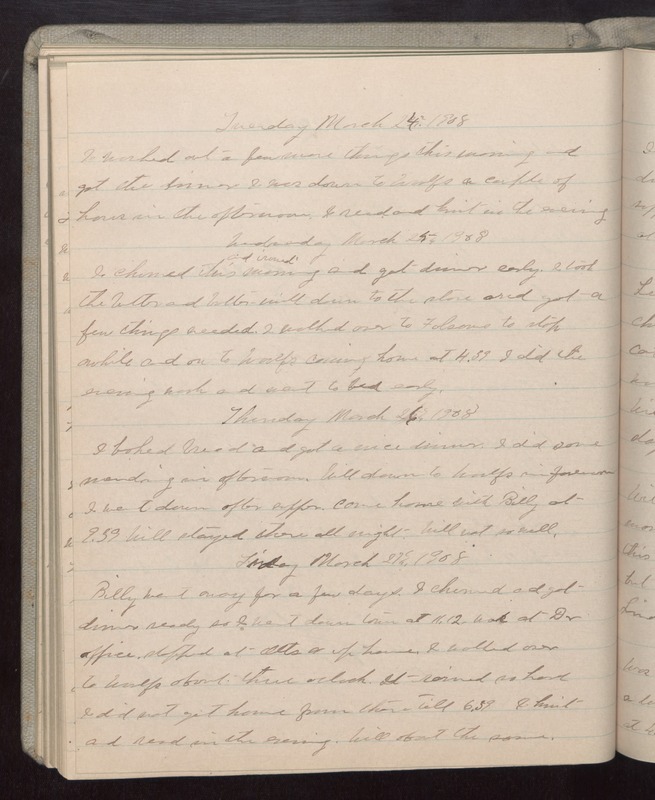 Tuesday March 24 1908 I worked out a few more things this morning and got the dinner. I was down to Woolfs a couple of hours in the afternoon. I read and knit in the evening. Wednesday March 25 1908 I churned and ironed this morning and got dinner early. I took the butter and butter-mill down to the store and got a few things needed. I walked over to Folsoms to stop awhile and on the Woolfs coming home at 4.39. I did the evening work and went to bed early. ThursdayMarch 26 1908 I baked bread and got a nice dinner. I did some mending in afternoon. Will down to Woolfs in forenoon I went down after supper. came home with Billy at 9.39 Will stayed there all night. Will not so well. Friday March 27 1908 Billy went away for a few days. I churned and got dinner ready so I went down town at 11.12. [illegible] at Dr office, stopped at Otts & up home. I walked over to Woolfs about three oclock. It rained so hard I did not get home from there till 6.39 I knit and read in the evening. Will about the same.